The IPO market has lots to celebrate today. It's only fitting that Party City is a guest of honor. Wall Street seems to think good times are rolling for Party City (PRTY), which is the largest party goods retailer in North America. It debuted on Thursday morning at $20.50 a share and closed at $20.70. That's more than 20% above its initial public offering price of $17 on Wednesday night. 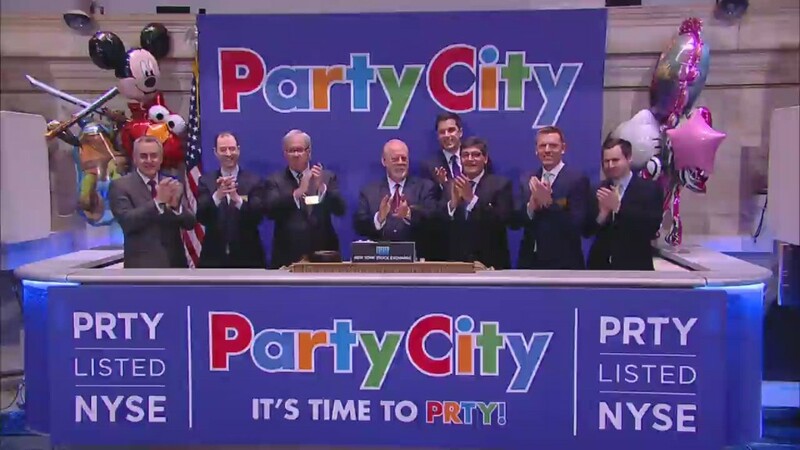 The coming out party was held at the New York Stock Exchange, where Party City is now trading under the ticker symbol "PRTY." The IPO values the retail chain, which sells everything from balloons and pinatas to costumes, at nearly $2 billion. Etsy (ETSY), the online marketplace for vintage and handmade goods, also began trading Thursday, making it the largest certified socially-responsible company, or B Corporation, to go public in the U.S.
Rounding out the IPO party Thursday was Virtu Financial (VIRT), a high-frequency trading firm that had its public debut delayed by a year due to the controversy sparked by the Michael Lewis book "Flash Boys," which argues that U.S. markets are rigged by high-frequency traders. Too much debt? The Party City deal raised $372 million, but the company doesn't plan to do anything wild and crazy with the proceeds. The cash will be used to help pay down its heavy debt burden, much of which was incurred when Thomas H. Lee Partners took a majority stake in the company in 2012. The private-equity firm now owns a smaller stake in Party City, though it remains a majority shareholder. While some investors may be alarmed by Party City's $2 billion in debt, management isn't concerned. "It is a lot of debt, but we've operated in a highly-leveraged environment for a long time," Party City CEO James Harrison told CNNMoney, noting the chain's first leveraged buyout took place in 1997. Harrison said Party City's business is "very, very stable" and features "great cash flow characteristics." He pointed to how even in 2009 during the Great Recession same-store sales only fell 2.9% and the company still posted a profit before interest, taxes and other expenses. Related: Netflix stock tops $500 for first time ever. Next stop = $900? The party is growing: Party City offers a way for investors to capitalize on the $10 billion retail party goods industry, which lures lots of customers during special occasions like Halloween, Fourth of July and the Super Bowl. Get ready to see more Party City stores. The chain already has 900 locations, but it sees an opportunity to open another 350 stores in North America and ramp up expansion overseas as well. If the banks underwriting the Party City IPO exercise their options, the total value of the IPO will rise to $428 million.